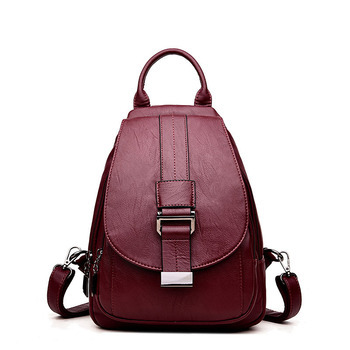 This Solid Color Fashion Genuine Leather Backpack has a clear fashion statement with simple styling. It’s has a beautiful and simplistic design with leather magnetic snap closure. Women can choose to use this handbag as a shoulder bag or a fashion backpack. You can perfectly match all your styles as the classical black makes it easy to match different outfits. Because it comes in a single color with good texture, extremely soft, comfortable and skin-friendly it will never out of date. Additionally, the bag has enough roomy compartments that are convenient for you to hold and organize your daily supplies, such as Smartphone, umbrella, purse, etc. Like a backpack. Nice to the touch. High Quality. Satisfied with the purchase. Arrived quickly. No smell. Recommend. Everything is fine. High Quality. Convenient. The pack good, recommend. Leather soft, no smell. Order come in 2 weeks. Excellent quality, very much backpack. It would be a little bigger size. But everything else was great. Delivery fast. Seller write that the order is shipped. Keep it up! Backpack come quickly. The quality is excellent. It Looks stylish and beautiful. Seller put a small gift. Thank you very much. Good! My second one just in different color. Fishy smell again. I alredy know that scent goes away so I can bare with it, because this backpack is pretty great. I like it. It had fishy smell at first, but "aroma" faded quickly. The backpack itself is beautiful. I'm very satisfied. satisfied very purchase! backpack as picture. skin feel comfortable, all straight stitch, zipper work. backpack no smell. top leather backpack webbing прошиты bottom, summer so will not stick to the skin. and put a4 book the roomy backpack backpack миниатюрно looks quite medium size. recommend. come backpack fast, really, color darker, beautiful but also thank the store good performance.